Up Date: 7:00 PM EDT The California High Speed Rail Bill has passed 21 – 16. Today is the crucial vote for High Speed Rail project in the California State Senate. As, BruceMcF pointed out in this week’s Sunday Train, it all hinges on the Democrats. In response to complaints, including from Senators (Joe) Simitian and (Alan) Lowenthal, that too much was being spent in the less heavily populated central valley, and not enough money was being spent in the more populous LA Basin and Bay Area, the revised Business Plan includes “early investment” in the bookends, to help prepare them for blended operation of HSR alongside more local rail services. 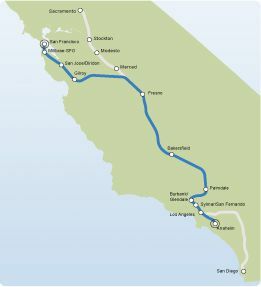 That early investment includes an agreement that will allow for the funding of the electrification of the Caltrain Corridor, serving Simitian’s own district, and key to the long term survival of the Caltrain service so that it is available for use when the next petroleum crisis hits. But, going by the description of a Simitian staffer of his position, these changes may not have been enough to convince Simitian to switch to a position of support for actually building HSR. The bill passed the Assembly and Gov. Jerry Brown has said that he will sign it but there are at least 6 Democratic hold outs. Since there all the Republicans are opposed and to pass the bill needs 21 of the 25 Democratic Senators, the funding totally hinges on these Senators. The California state Assembly on Thursday approved an $8 billion high-speed rail financing plan that likely will face a tougher vote in the Senate over the system’s projected $68 billion cost and concerns about its management. If it is approved, California could begin selling bonds for the project and lock in federal funds for a line in the state’s Central Valley. Senator Leland Yee, a Democrat from San Francisco, said the plan’s supporters have their work cut out winning him over, a sentiment other Democratic senators have shared with Reuters in recent days. This is crucial, because the federal Department of Transportation has made clear that they will revoke their $4.3 billion in federal funds for California’s HSR project, most of which came out of the stimulus package, if the state doesn’t approve funding today. This would undoubtedly stall the project, perhaps permanently. And California is probably the furthest along of any state on a high speed rail system. Building this leg of the system is crucial to transportation in the region, energy and fuel economy and it will create jobs in hard hit California. All of that should offset any negatives of bond funding, by increasing revenue brought in from more people workong and spending in California. Let’s hope a couple of these Democrats wake up and see the advantage to being at the forefront of a new transportation age. The settlement between government authorities and Barclays over the bank’s attempts to rig benchmark interest rates drew a picture of a bank that was negligent and corrupt at various times and to varying degrees. Unfortunately, as big banks go, that comes as no shock. It would be a shock if regulators and prosecutors found the resources and willingness to go wherever the rate-rigging scandal leads, even to the upper echelons of the world’s biggest banks and powerful central banks, including the Bank of England and the Federal Reserve. In a better America, Mitt Romney would be running for president on the strength of his major achievement as governor of Massachusetts: a health reform that was identical in all important respects to the health reform enacted by President Obama. By the way, the Massachusetts reform is working pretty well and has overwhelming popular support. In reality, however, Mr. Romney is doing no such thing, bitterly denouncing the Supreme Court for upholding the constitutionality of his own health care plan. His case for becoming president relies, instead, on his claim that, having been a successful businessman, he knows how to create jobs. This, in turn, means that however much the Romney campaign may wish otherwise, the nature of that business career is fair game. How did Mr. Romney make all that money? Was it in ways suggesting that what was good for Bain Capital, the private equity firm that made him rich, would also be good for America? Forget Bernie Madoff and Enron’s Ken Lay-they were mere amateurs in financial crime. The current Libor interest rate scandal, involving hundreds of trillions in international derivatives trade, shows how the really big boys play. And these guys will most likely not do the time because their kind rewrites the law before committing the crime. Modern international bankers form a class of thieves the likes of which the world has never before seen. Or, indeed, imagined. The scandal over Libor-short for London interbank offered rate-has resulted in a huge fine for Barclays Bank and threatens to ensnare some of the world’s top financers. It reveals that behind the world’s financial edifice lies a reeking cesspool of unprecedented corruption. The modern-day robber barons pillage with a destructive abandon totally unfettered by law or conscience and on a scale that is almost impossible to comprehend. More than half of all Mexicans are living below the official poverty line, but the new government has little to offer the poor majority or even to produce the long-term growth that Mexico once had. Sadly, Mexico’s economic progress will probably be quite limited until there is a more level playing field for elections. It seems foolhardy for governors to reject what is basically free money to help more people in their own states gain health insurance. Josh Barro wrote just after the ruling that while the White House’s stick was taken away, its carrot-the federal government’s picking up 100 percent of the states’ Medicaid expansion tab for the early years, gradually declining to 90 percent after that-would be enough to incite states to participate. And they stand to see other economic benefits. States that already provide coverage and care to people living at 133 percent of the poverty line would no longer shoulder those costs, saving them millions. Even for those that don’t offer such coverage, the bill stands to save all states money by getting rid of the “hidden tax” they pay in higher insurance premiums that account for the cost of covering the uninsured, also potentially saving millions. You can conduct byzantine transactions through opaque investment accounts and private corporations in offshore tax havens such as Bermuda and the Cayman Islands. Or you can credibly run for president at a time of great economic distress. I don’t think you can do both. Let me be clear that I have nothing against wealth. In fact, I have nothing against great wealth, which is how I would classify Mitt Romney’s estimated $250 million fortune. We can argue about the social utility of private equity firms such as Bain Capital, but Romney isn’t responsible for distorting the system so that financiers are grossly overpaid. He just took advantage of the situation. Increasingly, however, I have to wonder whether the achievement Romney touts as his biggest asset in running for president-his business success-might be seen by many voters as a liability. The huge LIBOR scandal that involves the manipulations of rates by the big banks is like a black hole that is sucking more and more into its center. Nor is this scandal victimless, as former former Barclay’s chief executive Bob Diamond would have the world believe. Devil’s advocates have also argued that while Barclays submitted improper Libor rates, there’s no evidence they influenced the rates. I read the FSA document quite differently. Recall that (so far) we have two phases of activity: one from 2005 to 2007, in which derivatives traders at Barclays would lean on the Submitters on a regular basis to place bids that would help improve the profits of positions they had on, and a later phase, during the crisis, where Barclays felt its peers were submitting lowball figures to the daily fixings and it was getting bad press for being an outlier, and it went to posting what it though were competitive, as in artificially low, data. We know that the big banks conspired to manipulate Libor rates, with the approval of government authorities. We know that the Libor manipulation effected the world’s largest market – interest rate derivatives. But who are the biggest victims? Sometimes the big banks manipulated the Libor rates up, and sometimes down. Different groups of people got hurt depending which way the rates were gamed. At one point in The Godfather Part III, Michael Corleone sagely remarks: “Never hate your enemies. It affects your judgment.” It was this lesson that George Osborne, as so often in his political career, forgot this week. After his aides were forced to “clarify” that he had never alleged that Ed Balls was personally involved in the Libor scandal (rather that he had “questions to answer”, a distinction without a difference if ever there was one), opinion is hardening among Conservative MPs that the Chancellor has overreached himself. Hard to disagree with that. July 6 is the 187th day of the year (188th in leap years) in the Gregorian calendar. There are 178 days remaining until the end of the year. 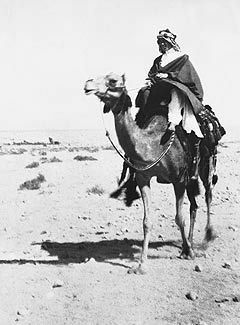 On this day in 1917, Arabian troops led by T. E. Lawrence (“Lawrence of Arabia”) and Auda ibu Tayi capture Aqaba from the Ottoman Empire during the Arab Revolt. Lawrence, sent by General Archibald Murray, commander of the Egyptian Expeditionary Force, to act as a military advisor to Emir Faisal I, convinced the latter to attack Aqaba. Aqaba was a Turkish-garrisoned port in Jordan, which would threaten British forces operating in Palestine; the Turks had also used it as a base during their 1915 attack on the Suez Canal. It was also suggested by Faisal that the port be taken as a means for the British to supply his Arab forces as they moved further north. Though he did not take part in the attack itself (his cousin Sherif Nasir rode along as the leader of his forces), Faisal lent forty of his men to Lawrence. Lawrence also met with Auda ibu Tayi, leader of the northern Howeitat tribe of Bedouin, who agreed to lend himself and a large number of his men to the expedition. Lawrence informed his British colleagues of the planned expedition, but they apparently did not take him seriously, expecting it to fail. Aqaba was not in and of itself a major military obstacle; a small village at the time, it was not actually garrisoned by the Turks, though the Turks did keep a small, 400-man garrison at the mouth of the Wadi Itm to protect from landward attack via the Sinai Peninsula. The British Royal Navy occasionally shelled Aqaba, and in late 1916 had briefly landed a party of Marines ashore there, though a lack of harbor or landing beaches made an amphibious assault impractical. The main obstacle to a successful landward attack on the town was the large Nefud Desert, believed by many to be impassable. The expedition started moving towards Aqaba in May. Despite the heat of the desert, the seasoned Bedouins encountered few obstacles aside from occasional harassment from small bands of Arabs paid off by the Turks; they lost more men to attacks by snakes and scorpions than to enemy action. During the expedition, Auda and Lawrence’s forces also did severe damage to the Hejaz Railway. Auda and his men reached the Wadi Sirhan region, occupied by the Rualla tribe. Auda paid 6,000 pounds in gold to their leader to allow his men to use Wadi Sirhan as a base. The actual battle for Aqaba occurred for the most part at a Turkish blockhouse at Abu el Lissal, about halfway between Aqaba and the town of Ma’an. A group of separate Arab rebels, acting in conjunction with the expedition, had seized the blockhouse a few days before, but a Turkish infantry battalion arrived on the scene and recaptured it. The Turks then attacked a small, nearby encampment of Arabs and killed several of them. After hearing of this, Auda personally led an attack on the Turkish troops there, attacking at mid-day on July 6. The charge was a wild success. Turkish resistance was slight; the Arabs brutally massacred hundreds of Turks as revenge before their leaders could restrain them. In all, three hundred Turks were killed and another 150 taken prisoner, in exchange for the loss of two Arabs killed and a handful of wounded. Lawrence was nearly killed in the action; he accidentally shot the camel he was riding in the head with his pistol, but was fortunately thrown out of harm’s way when he fell. Auda was grazed numerous times, with his favorite pair of field glasses being destroyed, but was otherwise unharmed. Meanwhile, a small group of British naval vessels appeared offshore of Aqaba itself and began shelling it. At this point, Lawrence, Auda, and Nasir had rallied their troops; their total force had been quadrupled to 2,000 men by a local Bedouin who, with the defeat of the Turks at Lissal, now openly joined Lawrence’s expedition. This force maneuvered themselves past the outer works of Aqaba’s defensive lines, approached the gates of Aqaba, and its garrison surrendered without further struggle. Andre Greipel won again yesterday for 2 in a row in a classic sprint finish. The breakaway was pulled in with a mere kilometer to go after a 3 kilometer crash that involved Tyler Farrar. Cavendish had to settle for 5th but did not lose much ground in the Points competition. General Classification top positions changed hardly at all despite Wiggins’ being one of those delayed at the stage finish. Marcel Kittel of Argos-Shimano had to withdraw due to stomach problems, the fourth overall. Today’s Point awards will be decided just before the only mountain of the day, a category 4 with a very steep descent. While most are predicting another Sprint finish, it’s distinctly possible that an attack like that which failed yesterday by a mere kilometer could succeed today with a little more altitude variation. Coverage is customarily on Vs. (NBC Sports) starting at 8 am with repeats at noon, 2:30 pm, 8 pm, and midnight. Saturday and Sunday 8 am live coverage will be on NBC proper. There will be some streaming evidently, but not all of it is free.